Last night’s Christmas edition of WWE SmackDown closed with a very interesting exchange between Vince McMahon and AJ Styles. You can see video of the segment above. There’s no word yet on where they’re going with this segment but speculation is that we’ll see a darker side to Styles. The segment ended with The Phenomenal One dropping the WWE Chairman, but only after McMahon slapped Styles in the face. 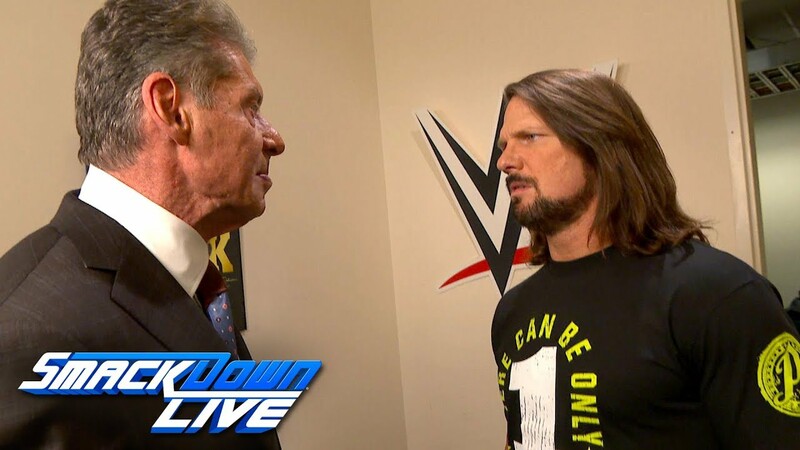 The backstage segment started with McMahon greeting Styles backstage, which was AJ’s only appearance on this week’s show. This was Vince’s second straight appearance for the blue brand following the “fresh start” that was announced by the McMahon family last week. Vince: I want to know, what’s your name? Vince: I want to know, who are you? AJ: AJ Styles, The Phenomenal One. Two-time WWE Champ. SmackDown Live… the house that AJ Style built. Vince: I was thinking about that. If this is the house that AJ Styles built, why aren’t you competing in your house tonight? Why is Daniel Bryan competing in your house tonight? Why is he raising holy hell and you’re back here walking up and down the hallway. I don’t quite get that. See, he’s the new Daniel Bryan. I want to know who the real AJ Styles is. Because, like it or not, we’re a lot alike. You got a black hole in your heart and I know it. But there’s an animal in there, an animal is begging to get out. That animal is eating you alive. You want it to come out, I want to see it. I want to see that animal. Oh yea, I want to see it, AJ. I want to see it, and I’m going to see it. That is when Vince slapped AJ in the face and the two stared each other down. AJ then fired back and dropped Vince with a right hand. Styles stood over Vince, growling, as officials rushed into the room and Vince barked at them to get AJ out. The video does not show this but a referee asked Vince if he was alright and Vince said he thinks he’s good. SmackDown went off the air with Vince laying on his back, smiling, while looking up at the ceiling. There were a few more edits made to the video released on YouTube, including Vince commenting on how he has seen WWE Superstars come & go, win their titles and earn their money, only to become complacent and then go home. Vince said he knows that’s not AJ, and that’s when he mentioned that they are alike. Vince also said AJ has a tormented soul, and AJ is afraid to lose control because of what would happen. Vince also said if AJ is harnessing all of this darkness, he will brutalize and terrorize the locker room.